All natural and therefore 100% safe to use Warpaint on a daily basis. Warpaint is for everyone, even for kids. We recommend it to anyone who has sensitive teeth. Warpaint comes in a 30g jar for around 150 uses. 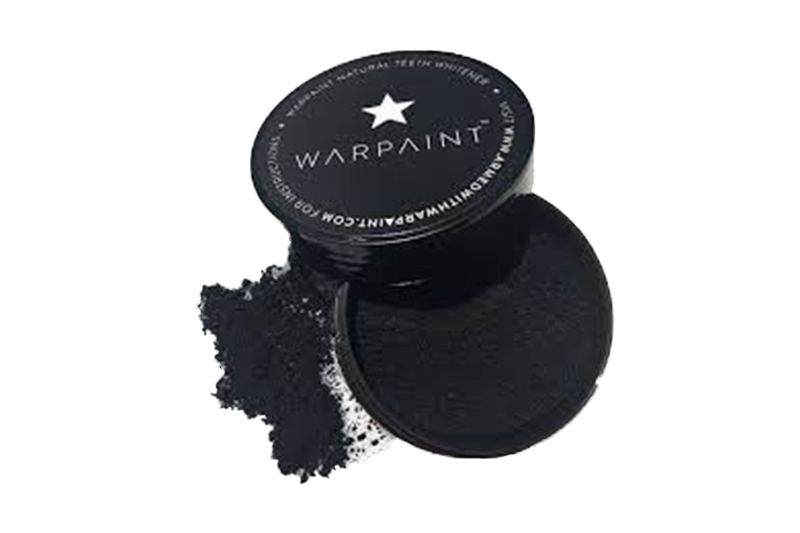 Warpaint is an all natural product, 100% vegan and cruelty-free! Made with Australian edible calcium bentonite clay that remineralises and strengthens teeth. It is rich in vital minerals that are very beneficial for our teeth and gums – like calcium and potassium. It is a very mild abrasive clay that gently scrubs and beautifully polishes the teeth. Bentonite Clay has been used for decades as a treatment for numerous health conditions and acts as a detoxifying agent to help fight gum disease by strengthening the body’s natural immunity. It works as an astringent by helping to remove tartar and cleans the gums. Also includes a non abrasive very fine activated coconut charcoal (the food safe type that is used in emergency situation in the Emergency Room for overdoses of medications, drugs and alcohol), it adsorbs materials, it is very porous and this allows the surface of the charcoal to attract and hold material and debris within the pores. Brushing with activated charcoal will help remove discolourations, stains (coffee, tobacco, tea, etc.) and debris and leave the surface area of the tooth clean and appearance will be whiter. Unlike all the harmful chemical and UV light based whiteners, Warpaint takes a holistic approach to oral health without any chemicals or additives. With carefully selected 100% natural ingredients. (I must warn you, it’s a jet black powder, so it’ll look hilarious in your mouth while you use it). You can use Warpaint as much or little as you like. It is very flexible, use it a few times a week or use it daily, it’s really up to you. You can use it instead of your toothpaste. Lemon Myrtle Organic (found on rainforest trees indigenous to Australia/Queensland, does not contain citric acid), a powerful microbial and anti-fungal agent that also contains calmative properties to soothe and relax. Organic peppermint to reduce infections and inflammation. Plus, it’ll keep you smelling fresh and zesty! Also has Activated Coconut Shell Charcoal; Calcium Bentonite Clay; Sweet Orange Peel Organic; Organic Peppermint; Organic Lemon Myrtle. Warpaint is Manufactured in a GMP Compliant Facility – Australian owned – Quality you can trust.